Discover an introduction to solar electric technology and how to use it based on system types, mounting options, shading, costs/benefits, and next steps to implement a system. 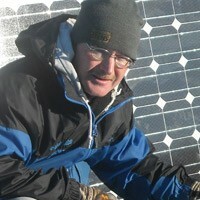 Jim, through his design and installation business, Energize, LLC, works to implement solar electric and wind systems, as a NABCEP Certified solar electric installer and a Certified Site Assessor in solar and small wind, for residential and commercial customers. Jim and Energize, LLC have been recognized in 2006 and 2009 by Focus on Energy for commitment and dedication to providing high-quality systems and excellent customer service.